The specifications also call for backup cameras. Looks like Jan is now working for Pace. Also, I wonder what engineering staff or consultants Pace has to make the specifications or pass on the requests for approvals. The 6700s, 17500s, and 18500s have this announcement, in place of "Caution, look both ways" on previous Axess series and MCIs. I'm not sure if the older buses had the announcement updated. As before, the timing seems too late to be useful, as the bus would have almost completed the turn before an operator or pedestrian could react if both were unaware of each other. I will try to pay close attention but some of the buses play both announcements simultaneously while others only play the pedestrian announcement. As before, the timing seems too late to be useful, as the bus would have almost completed the turn before an operator or pedestrian could react if both were unaware of each other. I suppose it depends on the speed. The Lake Cook example could be effective, in that the bus is masking a hairpin turn into the terminal, and pedestrians are streaming from the train. But, like most warnings, I'm sure it becomes part of the background noise. in place of "Caution, look both ways"
Wouldn't the look both ways one be directed to departing passengers, rather than pedestrians? I noted that this was added to the spec. The ENC questions included a request for clarification whether Pace wants the system as in the last build, or another brand.So, the correct inference from your observation is that the collision avoidance equipment was part of the build for those series. I think it was directing the bus operator to look for pedestrians, because it played during turns rather than when the doors were opened. 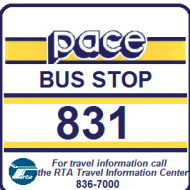 The specs you cited say "The system shall alert the bus operator and pedestrians", so Pace must have realized they can change the wording of the announcement to get pedestrians' attention as well. My question after reading the specs was whether the newer buses have additional equipment to detect objects that the sides of the bus might impact during a turn, or if they simply changed the announcement for clarity. My question after reading the specs was whether the newer buses have additional equipment to detect objects that the sides of the bus might impact during a turn, or if they simply changed the announcement for clarity. It seems pretty clear it is additional equipment. There are various references to "Pedestrian Warning--ProTran." and ENC asked if Pace wanted ProTran as in the last build or Mobileye. (Description of the ProTran system). ENC must have asked about Mobileye because it is a more complete system. The specification that the collision avoidance and lane departure system uses a windshield camera means that it is fundamentally the same as in a Toyota, and hence the reason I mentioned Jan.
Actually the look both ways is directed to the drive as he is turning, though one would think the driver should look both ways BEFORE turning. The caution us is turning is directed at pedestrians. The only passenger warning is the "Please move away from the doors" which plays when someone is in the rear doorway while the bus is in motion.